Цельнометаллический свободнонесущий полутораплан. Передняя часть фюзеляжа, включая кабину, представляла собой бронекоробку, склепанную из 5-6-миллиметровых стальных листов. Каркас задней части фюзеляжа и крыльев составляли ферменные конструкции из дюралевых труб. Обшивка крыльев и оперения - гофрированный дюраль, а задней части фюзеляжа - полотно. Самолет с заводским индексом J 4 и военным обозначением J-1 - первая серийная машина знаменитого авиаконструктора Хуго Юнкерса. Разработка проекта начата в середине 1916 года по заказу военного командования на тяжелый, бронированный аэроплан для непосредственной поддержки наземных войск. Первый полет прототипа состоялся в январе 1917-го, а в мае серийные машины начали поступать на западный фронт. Всего до конца войны на фирмах Юнкерс и Фоккер построено 189 экземпляров J 4 и еще 38 сдано по окончании военных действий. Несмотря на плохую скороподъемность и слабую маневренность, обусловленные недостаточной мощностью двигателя, самолет заслужил самых высоких оценок у летчиков и у пехоты. Благодаря бронированию и очень прочной конструкции из негорючих материалов, он считался практически неуязвимым от огня стрелкового оружия. "Юнкерсы" бомбили и обстреливали из пулеметов окопы неприятеля, а также осуществляли снабжение по воздуху немецких солдат на передовых позициях, куда из-за обстрелов не могли прорваться грузовики и повозки с боеприпасами и провиантом. При этом известно всего несколько случаев гибели "Юнкерсов" от зенитного огня или атак истребителей. J 4 считался самым "несбиваемым" самолетом Первой мировой войны. Широкую известность получил эпизод, когда одна из машин благополучно вернулась на аэродром с 480 пробоинами от пуль и осколков! Даже в случаях аварийных посадок бронекорпус надежно защищал экипаж от травм и увечий. Единственным серьезным недостатком J 4 была чрезмерно длинная по тем временам взлетно-посадочная дистанция, не позволявшая эксплуатировать самолет на большинстве прифронтовых аэродромов. 1 турельный "Парабеллум". На некоторые машины дополнительно устанавливали перед кабиной два пулемета, стрелявшие вперед-вниз через отверстия в бронекорпусе. To succeed and supplement the interim A.E.G. 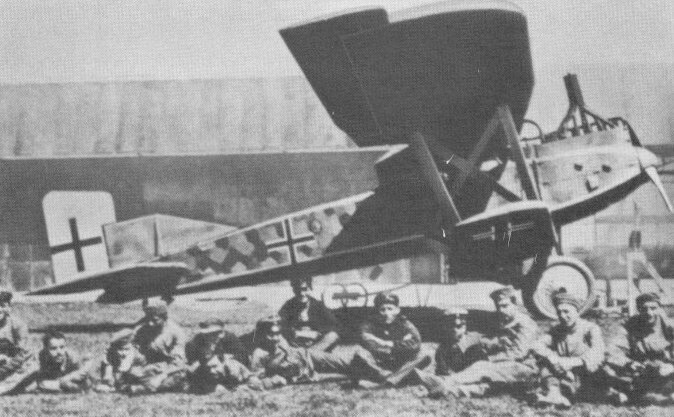 and Albatros J types (which had been little more than modified C types) the Junkers J I arrived in the Infanterieflieger units in 1917. It should be noted that the factory designation of this machine was J 4. In the past this has often been confused with the military J I designation. The J I was mainly the product of Dr. Hugo Junkers' fertile brain. 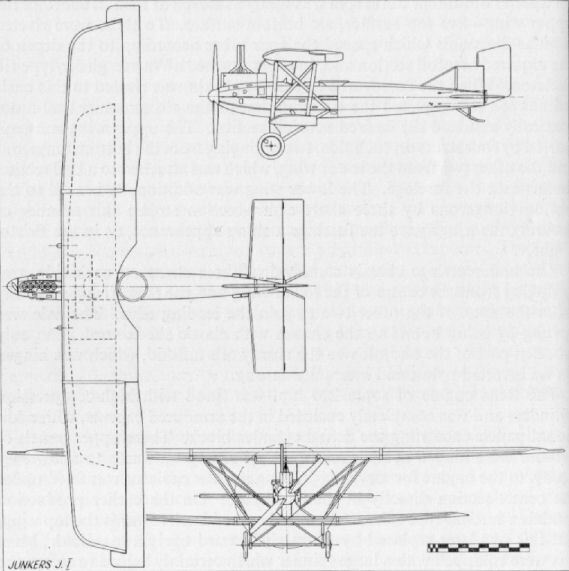 Dr. Junkers had pioneered the construction of all-metal monoplanes in 1915, when he produced the 120 h.p. Mercedes-powered cantilever J 1. This was followed in 1916 with an extremely neat and modern-looking monoplane, designated J 2, of which several were built. These aircraft were technically superior in constructional technique to anything that was then flying, though somewhat under-powered. Notwithstanding, the German authorities were so impressed with his constructional methods that Junkers was asked by the Flugzeugmeisterei to produce an armoured biplane. The first machine was partly designed by Prof. Madelung, who originally wanted it to be a parasol. It was completed early in 1917 and was of unique format. Corrugated sheet covering was used, as opposed to the plain sheet metal of the earlier J 1 and J 2. The medium was no longer tinplate (Eisenblech - literally sheet iron), but an alloy riveted to a dural frame. 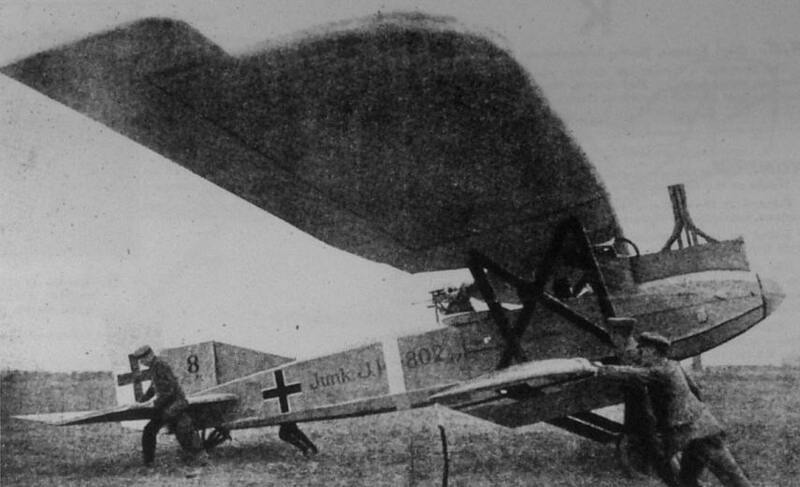 This aircraft became the J I, and it may be noted that Anthony Fokker was in no way connected with the enterprise at this time; his association with Junkers was not until October 1917. The unorthodox layout of the Junkers J I was comprised of a large upper and a small lower cantilever wing combined with a hexagonal-shaped fuselage, bestowing an angular yet curiously racy appearance. A completely armoured nose capsule of 5 mm. chrome-nickel sheet steel enclosed the engine and crew compartment, terminating in a solid bulkhead to give protection from immediately astern. To this was joined the rear half of the fuselage, consisting of an alloy tube frame which was fabric covered, although some of the last production machines had the corrugated skin. The tailplane and split elevators were of near rectangular shape. On the prototype a plain triangular fin and near rectangular-shaped, unbalanced rudder vas fitted, the fin being braced to the upper longerons by steel struts on either side. On production machines the fin was cut down in height and braced alternatively by a vee strut or a single strut on either side, and a horn balance portion was incorporated in the rudder, which was otherwise of parallelogram shape. Again the empennage was a dural-tube frame with corrugated covering. Of vast proportions, the upper wing was in three roughly equal panels, the centre-section being of constant chord with a large semicircular cut-out. The outer panels had some 5" of sweep on the leading-edge only, and were rounded to graceful rake at the tips. Ailerons of constant chord extended the whole length of the outer panels, and on the prototype were unbalanced. On the production machines, however, a large overhung balance portion was added; the chord was also increased, which gave the trailing edge a cranked appearance. The lower wing was of the same profile but only about one-third the area of the upper wing. Construction of the wings was based on a series of tubular dural spars, as many as eleven at the full chord of the upper wing - five top surface, six bottom surface. To these were riveted tubular diagonals which spaced the spar tubes according to the depth of the required aerofoil section and, in effect, formed a Warren girder-type rib skeleton. When the corrugated 2 mm. dural skin was riveted to this basic framework it completed the triangulation of the rib structure and automatically assumed the desired aerofoil section. The upper wing was supported by four struts on each side, two springing from the bottom longerons and the other two from the lower wing, which was attached to a keel section underneath the fuselage. The lower wing was additionally braced to the bottom longerons by three short centre-section struts; this manner of a ring the wings gave the fuselage a slung appearance, as in the Bristol Fighter. The undercarriage chassis consisted of three struts on each side, two springing from the centre of the lower wing and the third rising vertically from the apex of the other two to join the leading edge. The axle was sprung by being bound to the chassis with elastic shock cord. The only wooden part of the aircraft was the sturdy ash tailskid, which was hinged on an inverted pylon and internally sprung. The Benz engine of some 200 h.p. was fitted with high-compression cylinders and was completely enclosed in the armoured capsule, with additional panels encowling the actual cylinder block. These upper panels of armour were hinged at their rear end and swung outwards to allow easy access to the engine for servicing A long narrow radiator was fixed under the centre-section directly in the slipstream. On the earlier production models a vertical-type exhaust manifold curved back towards the top wing, but this was later replaced by a straightforward upright manifold. Most J Is were equipped with a large spinner which certainly helped to soften the angularity of the general lines, but these were frequently removed in the field. All flight controls were positively operated by direct linkage through a system of cranks and control push-rods, all enclosed within the airframe, and nowhere in the control system were cables used at all. This made for much greater invulnerability to small-arms fire from the ground, to which the J Is were continually subjected. The Junkers J I began to equip the Ft. Abt. (Inf.) units towards the end of 1917. Once crews had adapted themselves to this revolutionary aeroplane they viewed it with considerable favour, welcoming the measure of protection its armour afforded. Although heavy, cumbersome and difficult to land and take-off from rough ground, the J Is were immensely strong and well suited to their contact patrol duties, which consisted primarily of establishing the course of the Front Line and its alterations. All work was done at low altitude, and usually the observer reported the position to the rear command post by radio, although quite often message bags were dropped. Certainly these reports were the most reliable sources of news to the commanders in battle. Infantry co-operated with the aircraft by laying out cloth-strip ground signals or burning smoke flares to indicate their position. Ammunition and rations were dropped to machine-gun nests, trench systems and outposts that had been cut off and could not otherwise be supplied. Armament of the J Is was conventional, comprising two synchronized Spandaus firing forward and a Parabellum machine-gun manually operated by the observer. The mounting of twin fixed downward-firing machineguns had been found unsatisfactory due to the impracticability of aiming at ground targets from a low height, owing to the aircraft's speed. A total of 227 Junkers J Is was built. Description: Close support, armoured two-seater. Manufacturer: Junkers Flugzeug-Werke A.G. Dessau. (Junk.). Power Plant: One 200 h.p. Benz Bz IV 6 cylinder in-line water-cooled engine fitted high-compression cylinders. Dimensions: Span, 160 m. (52 ft. 6 in.). Length, 91 m. (29 ft. 10 3/8 in.). Height, 3.4 m. (11 ft. 1 5/8 in.). Area, 49.4 sq.m. (533.52 sq.ft.). Weights: Empty, 1,766 kg. (3,885 lb.). Loaded, 2,176 kg. (4,787.2 lb.). Performance: Maximum speed, 155 km.hr. (96.875 m.p.h.). Climb, 2,000 m. (6,560 ft.) in 32 min. Endurance, ca. 2 hr. 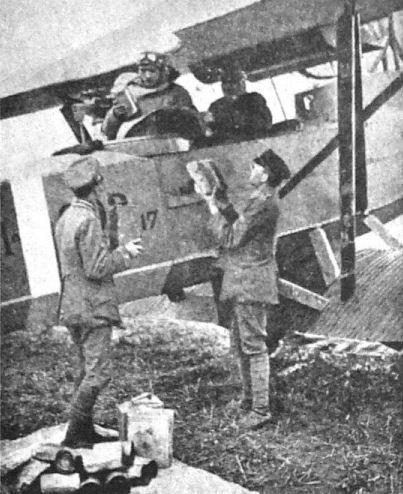 Armament: Two fixed Spandau machine-guns forward and one manually operated Parabellum machine-gun in rear cockpit. FOR some time past there have been rumours current of a German all-metal aeroplane in which, it was said, even the wing covering was of metal. It is not, however, until quite recently that we have been able to obtain reliable information concerning this machine. 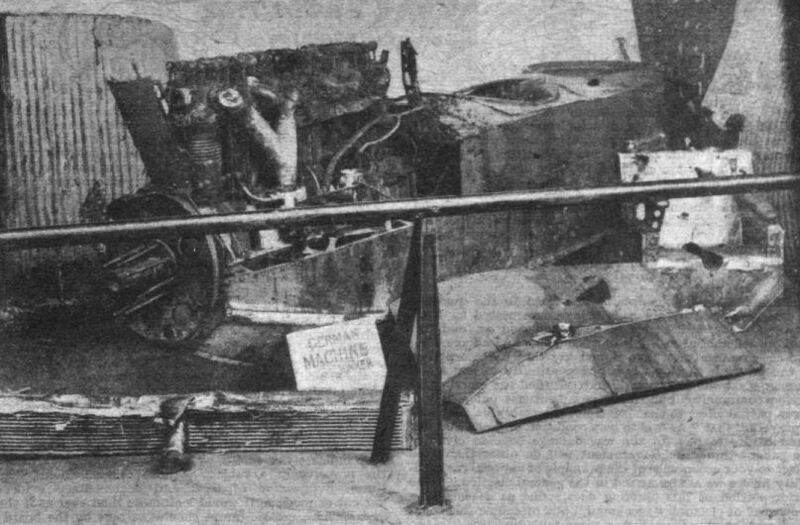 What is left of the Junker biplane, as the machine in question is called, is now included among the many interesting exhibits at the Enemy Aircraft View Rooms at the Agricultural Hall, Islington, where our representatives have been permitted to examine this machine in detail. Owing to the damaged condition of the specimen on view it has not been possible to give, this week, more than a brief outline of the main characteristics of the machine. Later we hope to be able to describe it in more detail. The Junker armoured biplane is designed for use as a trench fighter, and in contradistinction to the A.E.G. armoured biplane it was evidently designed with this object in view from the start, the armour not being attached, as a supplement, to an ordinary girder structure, as was the case with the A.E.G., but forming the main fuselage structure at the same time as providing the armouring. The shape of the front portion of the fuselage may be seen in one of the accompanying photographs. It has flat sides of armour plating, and a slightly curved top of aluminium. The bottom of the body is formed of three fiat surfaces, the middle one of which is horizontal, the other two sloping so as to connect the edges of the horizontal bottom with those of the vertical sides. The engine, a 230 h.p. Benz, is also protected by armour plating, which is detachable so as to allow access to the engine. This is accomplished by hinging the armour at this point, the port and starboard engine armour being separately detachable. In the accompanying photograph the engine armour of one side will be seen lying on the floor in front of the fuselage. The armouring is finished off just behind the gunner's cockpit, where it is continued across the fuselage by a curved armour plate shaped to form the gunner's back rest. Of the rear portion of the fuselage nothing remains on the machine examined, and nothing can therefore be said regarding the details of its construction. Judging from such evidence as fittings for large diameter tubes at the four corners it would appear that the rear part of the fuselage has been built up of a tubular framework of Duralumin. The wings of the Junker are of great interest as being of a construction very dissimilar to any so far seen. The internal construction of the wings is in the-form of Duralumin, tubes crossing diagonally and connecting the tubular spars, which latter are far greater in number than is ordinarily found in an aeroplane wing. It has evidently been the aim of the designer to distribute the spars over the wing section rather than to provide two spars located in the usual manner. In the Junker there may be said to be six spars if one counts the top and bottom tubes lying vertically above one another as one spar. The lower photograph will give some idea of the general distribution of the various wing members. In section the planes of the Junker are enormously deep, the maximum thickness of the top plane being about 16 in. The chord of this wing is a little over 8 ft. while the chord of the bottom plane is approximately 5 ft.
From the fact that no trace was found of inter-plane strut fittings it would appear that these members have been dispensed with in the Junker. It appears that the top plane centre-section was carried on a structure of tubes from the body, while the bottom plane appears to have been attached to the bottom of the fuselage by a series of diagonal struts. This arrangement, which would be made possible by employing such a deep wing section, would have the advantage that the gunner could fire forward at a considerable angle without danger of hitting a vital member of the wings. The undercarriage is in the form of two Vees, attached to the lower plane some distance out. From this point the bracing tubes of the bottom plane run to the body, thus transmitting the shock to the fuselage without, presumably, causing excessive bending stresses in the lower wing spars. The wing covering is in the form of corrugated aluminium sheet, and it was noticed that this did not form a fair curve over the wing framework, but was rather in the nature of a series of straight lines. This could hardly improve the aerodynamic qualities of the wing section, but on the other hand it is possible that the effects are not great. Later we hope to be able to give some details of this interesting machine. "Юнкерс" J-I, 221 авиаотряд ВВС Германии, лето 1918г. The clear winner of the early f917 close air support type competition was the extremely well armoured Junkers J.4, confusingly given the military designation, not of CL I, but J I. For a 200hp Benz Bz IV powered aircraft, the J I was both big and heavy, built to withstand the withering close-range defensive fire likely to be encountered, ranging from rifle to heavy machine gun. First flown on 27 January 1917, the J I employed the Junkers pioneered thick aerofoil wing that provided more lift than a thin sectioned wing of comparable area. With a top level speed of 96mph at sea level, the J I was neither fast nor agile. However, it was very effective in its role and much beloved of its crews, whose sense of well-being owed much to the demonstrable protection provided by the machine's armour cladding. From the offensive viewpoint, the J I was fairly well equipped for its mission, carrying two, pilot-aimed, fixed forward firing 7.92mm Spandau, plus the observer's 7.92mm Parabellum, along with underwing racks for light bombs. The J I's biggest problem lay not so much with the machine, but its makers, who were better researchers than production engineers: thus, initial deployment did not occur until September 1917 and despite the clamour for more, only 227 had been built by the time of the Armistice in November 1918. Tree-quarter front view of the Junkers J.I Biplane. 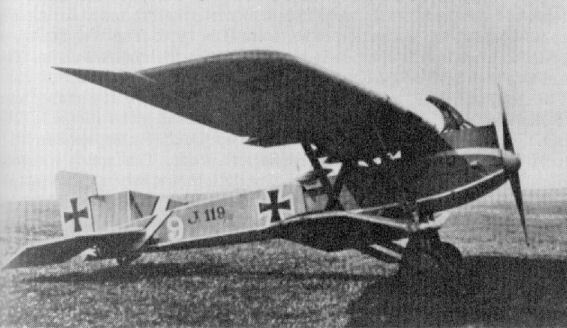 Side view of the Junkers J.I all-metal low-level close support and reconnaissance biplane of 1917 appearance. 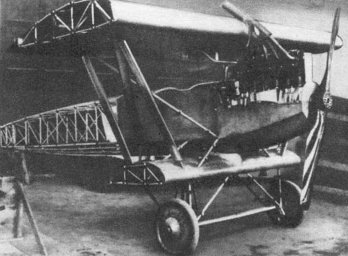 Front view of the Junkers J.I Biplane. THE JUNKER ARMOURED BIPLANE. - Front portion of fuselage, with engine. THE JUNKER ARMOURED BIPLANE. - End view of top-plane centre-section.